The race will feature the following age group categories for both the 5 mile and 10 mile race. Awards will be presented to the top three male and female finishers in each age group, in each race. We will also recognize the top three overall male and female finishers. All kids race participants will receive a finisher medal. All of our first place winners (overall and age group) in the 10 mile race will receive a custom podium shirt. The awards ceremony for the 5 mile race will take place at approximately 10 am. The awards ceremony for the 10 mile race will take place at approximately 11:00 am to allow the majority of 10 mile racers to finish. You must be present at the awards ceremony to receive your award. Awards and prizes will not be mailed. If you win something and bail on the awards ceremony, your prize will be added to the raffle goodies pile or given to a race volunteer. We will also offer a FREE kids 10 and under race, which will take place along the Mosquito Flats Trail and be approximately one half mile long. All kids race participants will receive a finisher medal. The kids race is not officially timed and no pre-registration is required, however parents must sign a waiver and pick up a race number for their child at registration. All entries include a soft and comfy cotton blend T-shirt, event neck bandana, as well as FREE race photos courtesy of the Georgia National Guard. Sizes guaranteed if you register before April 6. After April 6, sizes are first come-first served. If a size is shown in the menu when you register, it is still available. 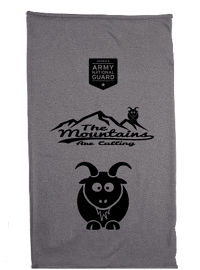 If you register very late and we are out of event specific shirts, you will receive a wicking Mountain Goat logo tee with your registration. Shirts run true to size. 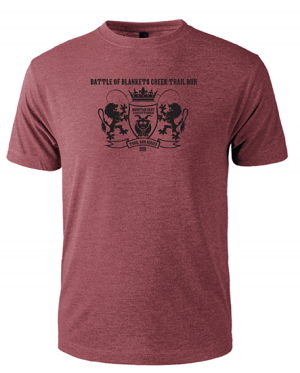 2019 Shirt Design - These are on Maroon Heather Tri-Blend Shirts! Buff Style Neck Bandana for 2019 pre-registered runners!